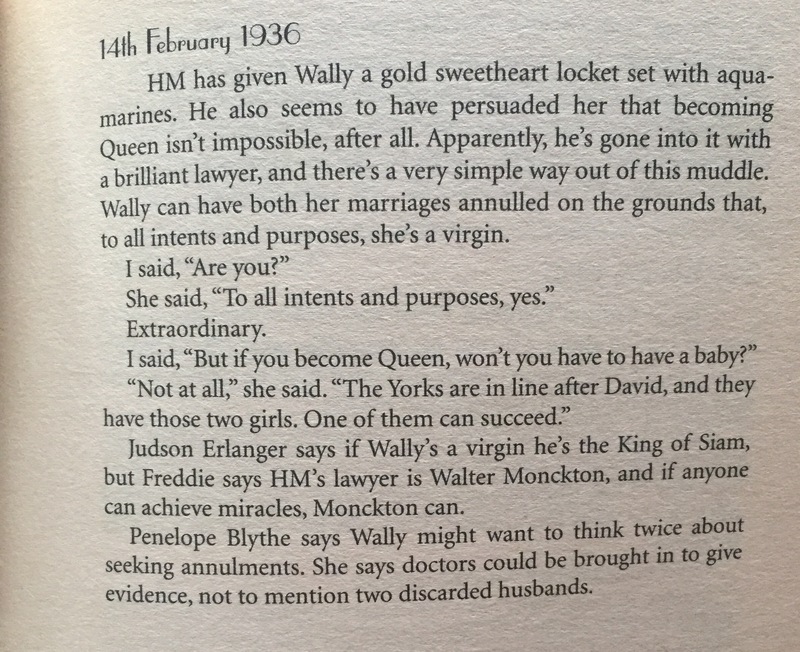 While reading Royal Flush last week, where one of Lady Georgie’s tasks is trying to keep the Prince of Wales away from Wallis Simpson, I couldn’t help but think of Gone with the Windsors – my favourite novel that features Wallis. Then I realised that I’ve mentioned it in passing several times on here* but never actually reviewed. So Recommendsday this week seemed the perfect time to remedy that. 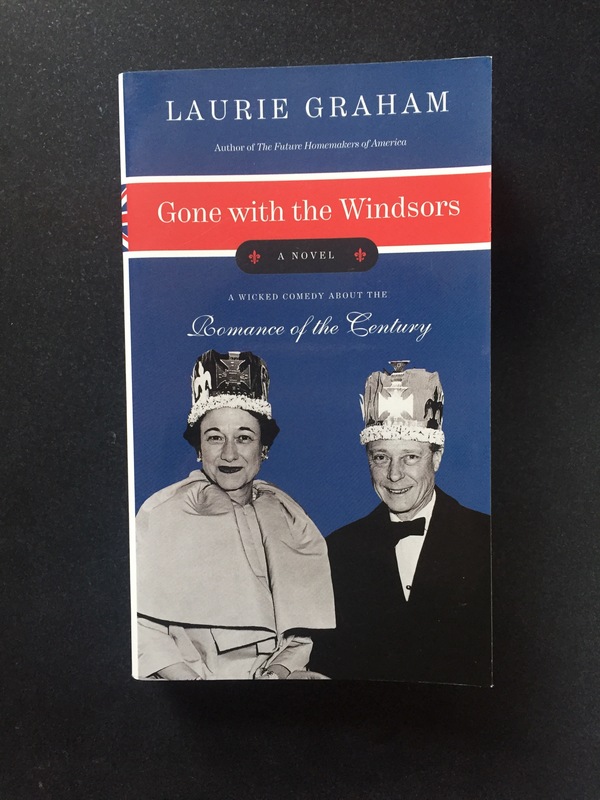 Gone with the Windsors is the story of Wallis Simpson’s romance with Edward VIII as seen throught he eyes of her (fictional) best friend, Maybell Brumby. Maybell is a recently widowed Southern Belle who comes to London to visit her sister (married to a Scottish Earl) to one up her social rivals back home just as one of their old school friends is making a stir by stepping out with the Prince of Wales. Soon Maybell is hobnobbing with royalty as Wallis (with the help of Maybell’s money) sets London society ablaze. Maybell and her family are carefully woven into the real story and as someone who’s read a fair bit about the Edward and Mrs Simpson and the 1930s in general, I didn’t spot any howlers. How could you not love Maybell’s insider view of the Abdication Crisis? The Wallis of Gone with the Windsors is a ruthless social climber, with an aim in mind, who doesn’t mind stepping on anybody to get there. David is weak and easily led, thinking more of his own pleasure than of his responsibilities. But Maybell is a total joy. I mean you wouldn’t want to be friends with her, but she is a brilliant prism to watch the slow motion car crash that was the Abdication Crisis. She is delightfully dim (witness her dealings with her sister Doopie) and part of the fun is watching her misunderstand what’s going on – or miss the undercurrents. Her sister is firmly on the Royal Family’s side against Wallis, while Maybell is convinced she’s picked the winner, which makes for fraught times on the summer holiday in Scotland. Maybell finds new ways to keep herself occupied during a summer at her sister’s Scottish estate. GWTW was my first Laurie Graham book – I spotted it in the window of Waterstones and had to have it – and since reading it she’s been an autobuy for me and I’ve picked up a lot of her back catalogue. I like her straight up novels too, but my favourite are the ones like this where she takes a historical event or person and puts her spin on it. I mentioned the Importance of Being Kennedy in my Inauguration Reading post, and The Grand Duchess of Nowhere was my first review for Novelicious, but A Humble Companion (about a companion to one of George III’s daughters) and The Night in Question (about a music hall comedienne who gets caught up in the Jack the Ripper panic) are also excellent. They’re both gorgeous, but I have a soft spot for the white one – as it was the first version I had. As you can see, I have two copies of Gone with the Windsors. The blue one is a signed copy sent to me by the author after I cried and wailed on Twitter about losing my original (white) copy** and it being out of stock everywhere, the other one is a secondhand copy I bought because the signed edition was too nice to read. So now the pristine blue on is on the shelf with the other Laurie Graham books and the white one lives by my bed for when I need a dose of Maybell. Maybell is just so much fun. Often unintentionally. In a fabulous twist of fate, Gone with the Windsors is coming out on Kindle later this month – I’d actually already written a sentence saying that I was said it wasn’t available Kindle so now I’m very overexcited at the prospect of having Maybell to hand whenever I need a pick me up. 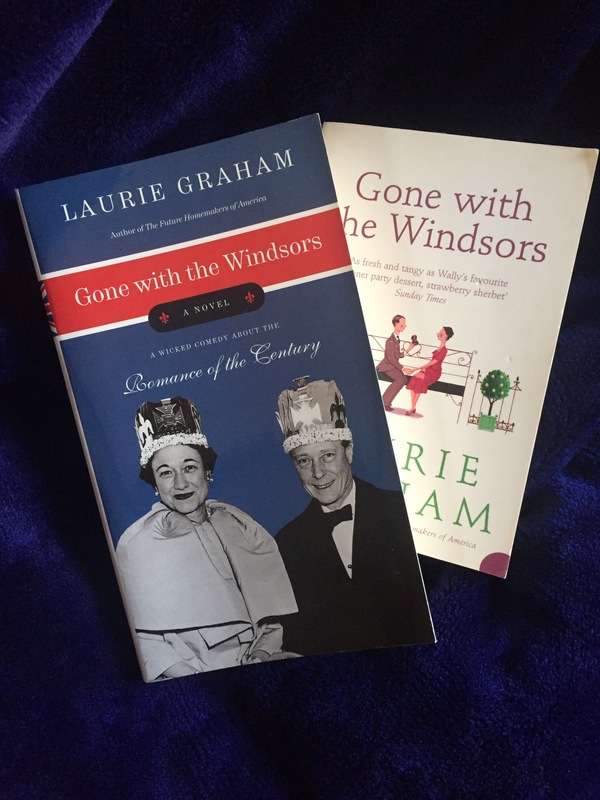 So, you too can preorder Gone with the Windsors on Kindle, or pick up a secondhand hardcover or a (new or secondhand) paperback copy from Amazon. I’m hoping the preorder link for her next novel – a sequel to Future Homemakers of America out in June – appears soon as it’s been more than a year since her last new novel came out and I’ve got withdrawal symptoms. Gosh this has turned into a long post. But I feel very good for having told the world about my love of Maybell Brumby and her crazy view of the world. I hope you’ve enjoyed reading it – and I hope you get0 the book. *Usually when talking about another Laurie Graham book to say that GWTW is my favourite. ** I lent it out without writing my name in the front of it and never got it back. It was a salutary lesson.